The AAMA 2015/2016 Study of the U.S. Market for Windows, Doors, and Skylight, show an increase in dem and for residential windows. This remains the trend this year. Specifically, there was an increase of over 6% due to new housing dem and and an estimated increase for the next two years. This clearly indicates that investing in replacement windows in Chesterfield, MO, remains popular. 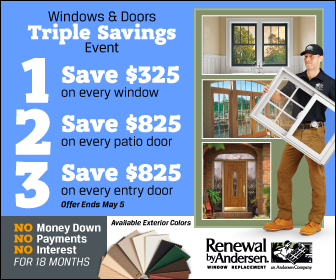 Among the options available today, you can count on the beauty, durability, and energy efficiency of the replacement windows offered by Renewal by Andersen® of St. Louis. Let us discuss why they make great alternatives. We offer windows that come with insulating properties for a cozier home. They feature High-Performance™ Low-E4® glass that will reduce the amount of heat that enters and leaves your home. Furthermore, their Fibrex® frames offer superior insulation. Additionally, we apply insulting foam in our window installation process to keep the elements out. These will keep you from using your HVAC units too much, assuring you of more energy savings. Apart from the insulating qualities of Fibrex, this composite also has twice the strength and low-maintenance features of vinyl. This makes it resistant to fading, rotting, corroding, exp anding, and contracting despite extreme changes in temperature. This will lessen the need to spend time and money on keeping your windows in top shape. Furthermore, just like with our Chesterfield doors, our windows come with exclusive warranties for your peace of mind. Our windows can also help enhance your home’s aesthetic value. They are available in a wide range of styles and design options that will add character to your home. Choose from an array of interior and exterior colors, such as pine, oak, and forest green, for your home to blend with its surrounding l andscape. You can also customize your windows further with stylish grille patterns and hardware. As a Chesterfield, Missouri windows company committed to excellence, we’ll be sure to provide you with windows that make for a good investment. You can also expect Renewal by Andersen of St. Louis to conduct a flawless and airtight installation for lasting and optimal performance. Call us today at (314) 332-2364 for a FREE estimate.